The following U10 reports are from the 2015/2016 season, we will be publishing more reports as we progress through the current season. 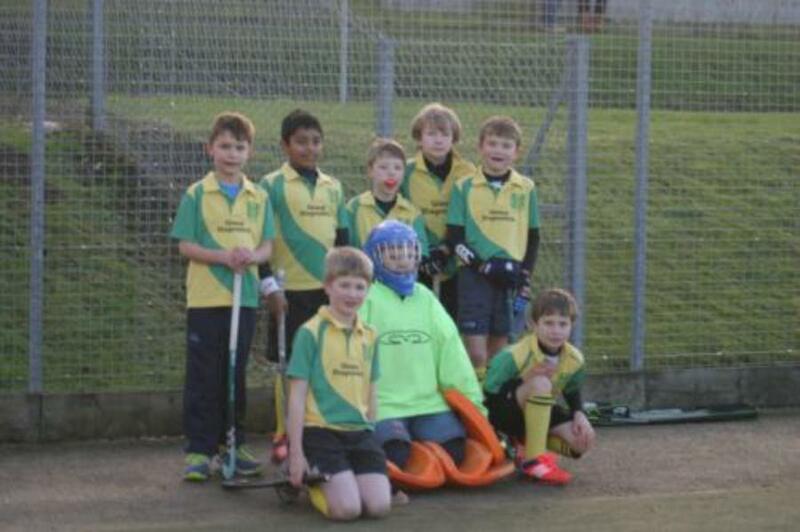 Under 10s away at Harleston for season opener! Of Storms, Sickness and treasured hockey skills to behold! 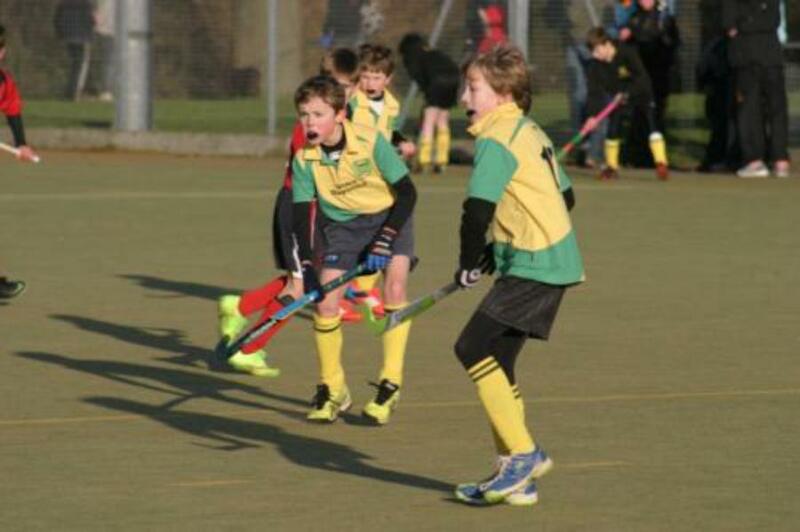 On a windswept, sickness-affected November Sunday morning, two keen hearted crews of Under 10 Norwich City Hockey Club boys took to the field, away at Magpies for their first, long awaited matches of the season. 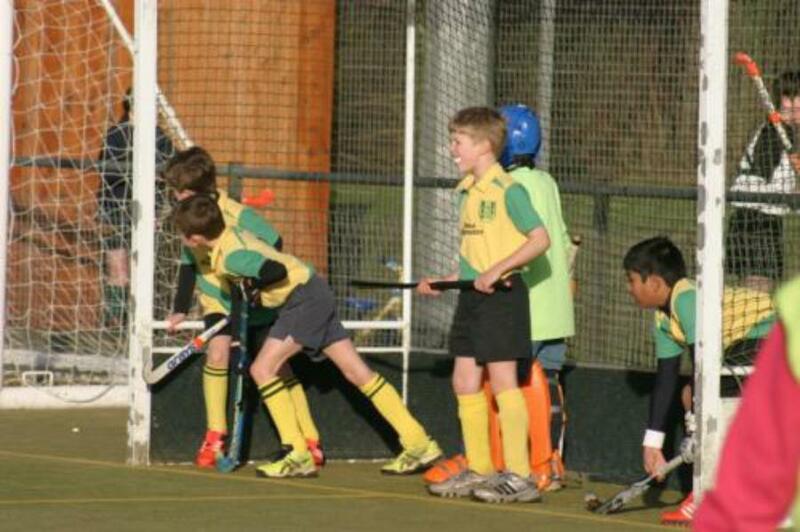 The two teams, Jets, (in their traditional yellow and green) and the Dolphins , in their newly adapted kit of yellow and green with orange socks) put the weeks of gruelling training and preparation to good effect, competing well in all games against a Magpies A, Magpies B and Ipswich side. What was really impressive and great to see, was the way in which the two Norwich City teams took the time to watch, applaud and cheer for one another, promoting a real club ethos. Of course the gloves were off when facing each other in the head to head fixture. Special team thanks go out for stepping in to the shoes of those not able to play due to last minute sickness….Josie Miller who kept an impressive 6 out of 7 clean sheets, keeping goal for both the Jets and Dolphins, Lucas Hay anchoring the defence and ‘parking the boat’ for both teams and Harry Ford, stepping in to brother Ollie’s (not a monk) shoes - well, goal keeping kit to be more accurate, to keep goal for the Dolphins in the head to head. Once we did get the ball out of defence we looked a threat with some good distribution from the back from Ellis, Freddie and Lucas, with Jurian and Charlie able to find space and move forward with pace. Added to this was some clever controlled reverse stick hitting down the line from Louis, finding his team mates in wider positions to attack down the flanks. Both teams had fairly equal amounts of possession, with neither able to find that break through. Some more good counter attacking hockey with pace. Early action saw a great attempt on goal by debutante Jurian with more fast attacking hockey from Charlie who was a constant nuisance to the Ipswich defence. Again, our defence was at times a little disorganised, with some of our players so eager to win the ball, they ended up tackling each other. More solid work in the middle of the park by Freddie helped break up attacks early and kept pressure away from the defence. Another clean sheet, with a couple of opportunities that on another day, could have seen us win the game. Some great keeping with Josie making a number of saves keeping the Dolphins in this games with the defence coming under lots of pressure. When the opportunity to look up came about it was encouraging to see Lucas getting the ball away, finding Charlie to hit them on the break. As in previous matches, we looked a little nervous when defending, but against the more senior of the Magpies team, this was a great effort and one the boys should be proud of. With more clinical finishing on both sides, 3-1 would have been a fairer result. A stronger start to the match saw a great ball straight out of defence set up Corey for an early shot on goal that just went wide. Magpies, then went close with narrow miss well covered by Josie in goal. The Jets seemed a little slow in decision making and passing in the centre of the park, (nerves, a sense of occasion, or just no one to pass to in space,??. Always good though to leave with something to take back to the training pitch. On an attaching note it was also good to see Harry ‘Houdini’ Ford appearing in some great forward attacking positions and getting in on some reverse stick hitting action of his own. Building on from their previous win, a quick goal by Corey inside the first min following some great attacking play from Ed and Harry, settle nerves and allowed the boys to turn on the style. Some more brilliant positive right wing work from Ed and then Harry ‘Ford, refreshed from his stint in goal brought about his first goal of the morning and The Jets second of the match. More sustained pressure saw Mattie Roy go close before Harry chipped in with his second goal. More good work out on the right by Harry carved out the opportunity for Corey to score his second (Jets fourth) before a well rehearsed short corner routine saw our 'power hitting specialist’ Krishna ‘The Rocket’ Patel fire an unstoppable shot past a stationary keeper. A quickly taken free hit from Corey later in the game then released Harry to slot in his third to complete his hat-rick and finish the game six goals to the good and with a clean sheet as well. For the second tournament in a row the U10 girls came away with Gold Medals and again their goalkeeper, Sophia Colman, was barely called into action during the 6 matches. Playing in glorious February sunshine the girls got off to a fast start in their first match. Despite the games only being 8 minutes long they managed to find the net 5 times with Octavia Udy (4 goals) and Niamh Campbell completing the scoring. Their second game again saw the girls dominate with Sabina Baker and Matilda Butterworth combining well to set up Octavia to score the winning goal. 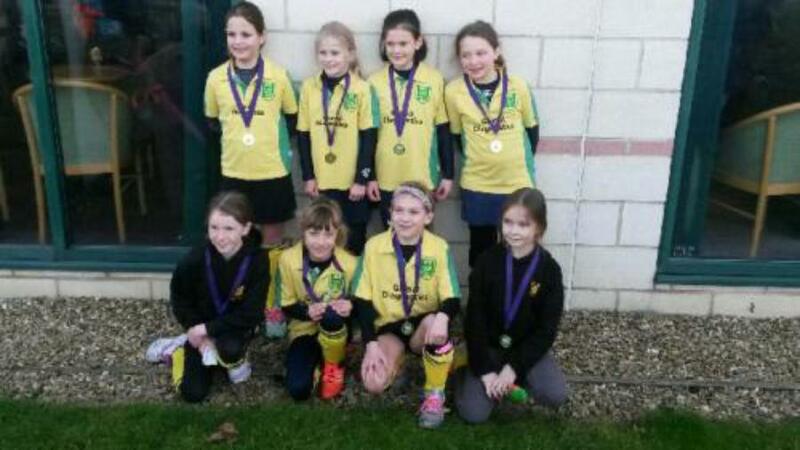 A young Dereham team were next up and constant pressure told as Niamh, Maddie Hallam, Matilda and Sabina scored in a 4-0 win. It was good to see that the girls were beginning to play some excellent hockey with the ball moving quickly down the wings and away from the congested centre of the pitch. Our next game saw us pitted against an improving Dragons team and for the first time in the tournament Talitha Cooke in defence was called into action but alongside Sabina they managed to snuff out any attacks before Sophia in goal was needed, the game was won with a fantastic finish from Ivy Fisher who robbed the goalkeeper before slapping the ball hard into the corner of the goal. What was on paper our toughest test again proved to be the case as a resolute Magpies 1 defence and excellent goalkeeping prevented any goals being scored, the one positive thing being that the girls realised after this game that the closer they get to the goalkeeper the harder it is to score. Despite the tournament being won before the final game (the girls weren’t told this) the team saved their best hockey until last with some excellent ball retention from Octavia and Matilda, great distribution from Sabina and some good powerful strikes on goal from Niamh, from one of which saw Octavia pick up a rebound to score the winning goal. In Summary. What was particularly pleasing was that we had 6 different goal scorers in the tournament, the girls team work and spirit was superb which made it an all round enjoyable day. A big thank you must go to all the parents for supporting throughout the day in the unusually warm sunshine, all the players for their effort and especially to Sophia for being a spectator/goalkeeper for the day. Cold it was but happy not to be in King's Lynn this weekend were we. Those that partook of the last hot chocolate can pity the later U12 tournament with narry a cup of tea to be had for the warmth so vital to the efficient working of muscles, and apart from the spectators it can be tough on the players too. It takes a while for teams to gel sometime but not Norwich, the boys pushed on from the start and Watton, who had already had a game to act as warm up, must have felt themselves lucky to escape with a draw by the end. MOM Edward Beake and Mason Goodall who gave it plenty working together right from the get go, stretching the defence so close to breaking point. An unfortunate break from Dragons on the far side of the pitch during our substitution gave them the first followed up rapidly with a short corner that was met by a slow response off the line and allowed them in once more. Disappointment is inevitable from time to time and how players handle this is a key learning point: we handled it with composure and maturity that some beyond the boys' years struggle with; taking comfort from the sharper passing game that we put together and the strikes that just might have been. MOM Sebastien Kimber for keeping a clear head while chaos briefly reined all around and Matt Roy and Lucas Hay for sheer work rate. Plenty of attacks again kept us camped in the opposition half, and the music began to play with Jago making sensible passes upfield to the open stick and Hugh valiantly giving it everything to intercept passes in defence. Will took charge of the midfield position and spread the ball wide and fast, tracking back to help deny Watton a passing game - everything we needed of them. MOM Hugh Garson, Jago Taylor and Will Hopgood. A more balanced game and one in which our Hockey play showcased this young team's talents. Particular note was Alex's determination covering a lot of the pitch, timing his passes and runs perfectly and anticipating the opposition's next move. Dragons didn't seem so threatening somehow, more like Iguanas really. In all the games we had more attacks, shots on goal and the majority of possession and the draw against the eventual winners in the final game during which we pinned them in their half for the majority of the 11 minutes should give us satisfaction that we are as strong as we want to be and can play the better Hockey. Further, with determination and certainty of purpose we will take our chances and to this end I look forward to next week's tournament on home ground. Well done to all and thanks to the parents for their support and encouragement. Squad: Seb Kimber, Lucas Hay, Alex Illing, Jago Taylor, Matt Roy, Edward Beake, William Hopgood, Hugh Garson and Mason Goodall.